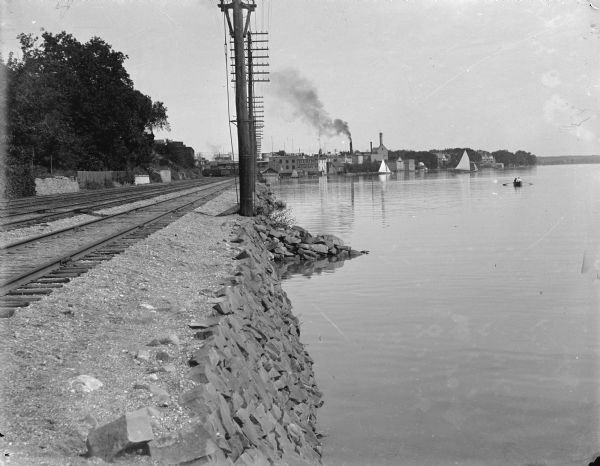 A view east along the north shore of Lake Monona, with Madison's east side industrial area in the background. Tall utility poles and railroad tracks follow the shoreline. The Deering Harvester Company is identified by a sign painted on its wall; large letters on the roof identify the "Advance Thresher Co." The tallest tower right of the smokestack is part of the Fauerbach Brewery complex. The short domed structure on the shoreline is a gazebo which was also a part of the Fauerbach complex. Large private homes are seen on the far right. There are people in a rowboat and in sailboats in the background. See also Image ID: 83154. Image ID: 57484 is a bird's-eye view of the Fauerbach Brewery.